Black, rugged, weatherproof #42 knotless nylon double-sided slip-on net. 8'H x 8'W. Constructed of heavy wall schedule 40 aluminum 1.9" O.D. pipe. Heavy duty legs are welded to provide extra rigidity. Comes with black, rugged, weatherproof #42 knotless nylon double-sided slip-on net. 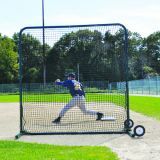 Includes two 10" diameter x 4"W no-flat tires that make transporting the unit easy. 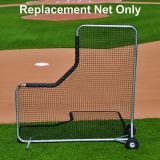 Larger size to protect your fielders from stray balls. 8'H x 8'W. Constructed of heavy wall schedule 40 aluminum 1.9" O.D. pipe. Heavy duty legs are welded to provide extra rigidity. Comes with black, rugged, weatherproof #42 knotless nylon double-sided slip-on net. Includes two 10" diameter x 4"W no-flat tires that make transporting the unit easy. 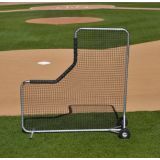 Larger L-shaped design with padded hip protector provides safety for pitchers. Size is 8'H x 8'W. Constructed of heavy wall schedule 40 aluminum 1.9" O.D. pipe. Heavy duty legs are welded to provide extra rigidity. Comes with black, rugged, weatherproof #42 knotless nylon double-sided slip-on net. Includes two 10" diameter x 4"W no-flat tires that make transporting the unit easy. Tri-fold screen. Main screen is 8'H x 8'W with two 8'H x 4'W fold in wings. This provides an overall screen size of 8'H x 16'W. Black, rugged, weatherproof #42 knotless nylon double-sided slip-on net. 7'H x 7'W. Constructed of heavy gauge 1-5/8" O.D. galvanized steel tubing with a durable, attractive green powder coated finish. Heavy duty 2" square galvanized steel legs provide extra rigidity. Black, rugged, weatherproof #42 knotless nylon double-sided slip-on net. Includes two 8" diameter wheels that make transporting unit easy. 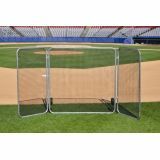 Required protection screens for players during batting and fielding practice. 7'H x 7'W. Constructed of heavy gauge 1-5/8" O.D. galvanized steel tubing with a durable, attractive green powder coated finish. Heavy duty 2" square galvanized steel legs provide extra rigidity. Black, rugged, weatherproof #42 knotless nylon double-sided slip-on net. Includes two 8" diameter wheels that make transporting unit easy. 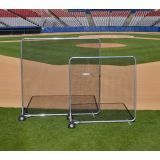 Required protection screens for players during batting and fielding practice. 10'H x 10'W. Constructed of heavy gauge 1-5/8" O.D. galvanized steel tubing with a durable, attractive green powder coated finish. Heavy duty 2" square galvanized steel legs provide extra rigidity. 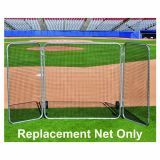 Black, rugged, weatherproof #42 knotless nylon double-sided slip-on net. Includes two 8" diameter wheels that make transporting unit easy. 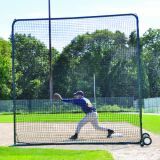 Versatile 7' x 7' “L-Shape" design accommodates left or right-hand pitchers. 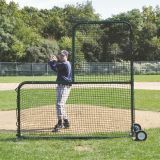 Works with pitching machine or live arm delivery. 7 x 6 Green Economy Net for fielder's screens. 7 x 6 Green Economy Net for fielder's screens. "L-Shape" design accommodates right or left-hand pitchers.